Peeling for Dry, Very Dry, and Delicate Skins. BIOREGENE Doux Peeling Crème is a truly magnificent exfoliating cream for nearly all skin types. It is tolerated comfortably even by the most delicate skin. It gives a new luster to the epidermis by eliminating dead cells and stimulating the growth of fresh, vigorous, well-hydrated tissue. BIOREGENE Doux Peeling Crème is rich in natural extracts, vitamins, and biological factors. It harmonizes the horny layer by removing excess keratin and deep-seated impurities, thus improving the oxygenation of the skin and easing microcapillary circulation. It is a superb product for the reduction of congestion and couperose. 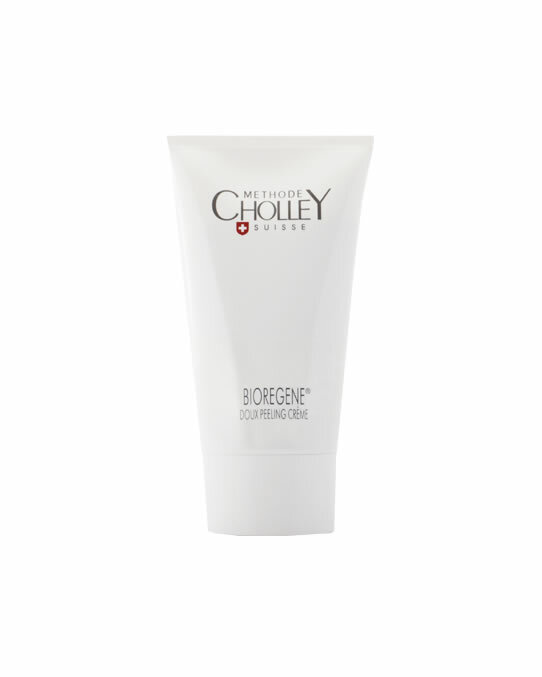 BIOREGENE Doux Peeling Crème refines the skin and gives it a fresh, revitalized look. It may be used a couple of times a week to stimulate cell renewal and oxygenation of the skin. Using the fingertips, apply a consistent layer of BIOREGENE Doux Peeling Crème on the entire treatment zone with light circular motions. Let the cream rest for 10–15 minutes. Remove the mask with lukewarm water or a soft humid microfiber mitt. For dry, very dry, and delicate skins.